I have been very fortunate to have great health, I have rarely been to the doctor in my life. I was speaking to somebody recently about his advice of getting a physical on a regular basis. I am at an age where that is probably wise. He spoke of his own reluctance to get regular checkups and the impact that cancer had on his health. It could have been diagnosed much earlier in his life if he had been going for regular check-ups. For all of our complaints, we have a truly amazing health care system and well caring staff. I was at The University of Saskatchewan Medical school speaking to 4th year residents about soft skills and managing their career. They are entering into a much different world than the doctors that are training them. My first slide was a picture of the founders of Google. My first comment was that they are entering a new era as doctors where patients will now arrive in their office with both the symptoms and what they think are the solutions. This is both a gift and a challenge in a world where WebMD is now most people’s first place to go when they have health issues. There are many benefits to this and increasingly more risks. We live in the age of the “instant expert”. Who needs 10,000 hours and many years of training when you have Google? Funny enough I was speaking with a new client and I asked her how she heard of us. She shared “the old way, I Googled you”. Google is a fantastic tool but when it comes to your career and health, it’s always a great idea to talk with the experts. Sophisticated tools and expertise are required to discover the best answers. Self-diagnoses in a health issue can seriously raise your health risks, so can a career self-diagnosis. Say, “awe”. 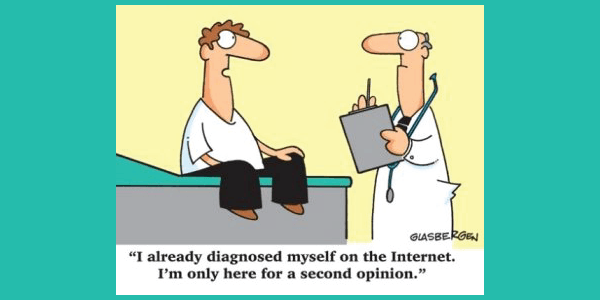 When is the last time you had a “career check-up?”. P.S. CareerJoy’s individual Public Service programs help you achieve greater success in your Government career. You can take advantage of CareerJoy’s Government programs through your Personal Learning Plan. Join our next lunch and learn webinar on Tuesday July 17 to explore the Career Identity Program for the Public Service, the Talent Management Program for the Public Service and other opportunities for you to invest in your Public Sector career.